In astronomy, Gemini is a constellation in the northern sky and one of the constellations in the zodiac, which is the area of the sky that includes the apparent paths of the sun, moon and planets. The Gemini constellation has been described by cultures since ancient times and remains one of the 88 modern constellations defined by the International Astronomical Union (IAU). Gemini is Latin for "twins," although the twins identified with the constellation depend on the culture, according to Encyclopedia Britannica. In Egyptian astrology, the constellation was identified with twin goats, while Arabian astrology said it was twin peacocks. The Western world tends to identify these twins as Castor and Pollux from Greek myth. But other twin pairs identified with Gemini in the Western world include the older and younger Horus and the mythical founders of Rome, Romulus and Remus. Gemini was also the namesake of the Gemini program, a NASA space mission in the 1960s that launched pairs of astronauts into space in the Gemini spacecraft. This constellation also inspired the names of the Gemini Observatory (twin 8.1-meter optical/infrared telescopes in Hawaii and Chile) and the Gemini Planet Imager used by the Gemini South telescope in Chile. Gemini is fairly easy to spot in the sky, even for amateur stargazers. It is located northeast of the constellation Orion and between the Taurus and Cancer constellations. Best viewing is during February. By April and May, the constellation can be seen soon after sunset in the west. 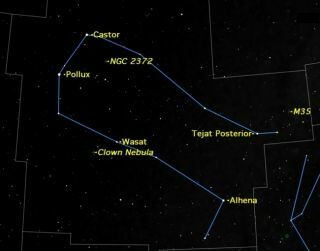 The two brightest stars in the constellation, also named after Greek mythology's Castor and Pollux, represent the heads of the twins, while fainter stars outline the pair's bodies. Pollux, a red giant star, is 33 light-years from Earth, according to NASA, while Castor is about 51 light-years away from us. (A light-year is the distance that light travels in a year, which is about 6 trillion miles, or 9.6 trillion kilometers.) Pollux has at least one massive planet orbiting it, while Castor has two companion stars. The Eskimo Nebula, also known as the Clown Nebula, displays gas clouds so complex they are not fully understood. Other notable objects in the constellation include the Eskimo Nebula, Medusa Nebula and Geminga, a neutron star. Gemini also includes a star object known as Messier 35 or M35. The Messier objects are a set of 110 astronomical objects first cataloged in 1771 by French astronomer Charles Messier. M35 is just barely visible to the naked eye under a dark sky free from light pollution, and in low-power binoculars, this object looks like a cloud with bright stars in it, according to Space.com skywatching columnist Joe Rao. Gemini is the radiant point for a meteor shower known as the Geminids, which happen every year around mid-December. Astronomy experts say the Geminid display is one of the best annual meteor showers because the individual meteors (space rocks burning up in Earth's atmosphere) are bright and move quickly. These meteors are especially visible in years when there is no full moon in the sky to wash out the starlight. The Geminids are associated with a weird near-Earth asteroid called 3200 Phaethon, which is shedding particles likely because of a collision in its ancient past. As Earth runs into these particles in its yearly orbit around the sun, some of the rock bits fall into our atmosphere and produce spectacular meteor trails. Read the story behind the names of the Gemini twins, from the Chandra X-Ray Observatory. This article was updated on Feb. 19, 2019 by Space.com contributor Elizabeth Howell.